Have you guys tried Gooey Bars? The jist of them is that you take whatever flavor of cake mix you like and make these ooey gooey bars with it. I noticed that my local grocery store had a few new flavors of cake mixes, like key lime, pink lemonade and creamsicle so I wanted to try at least one of them out. Since St. Patrick's Day is so close I went with key lime. It is delicious, sweet and sour from the key lime. Enjoy! 1. Mix cake mix, melted butter and one egg. Pat into 13x9 inch pan. 2. In a separate bowl beat cheese until fluffy. Add 2 remaining eggs to cheese and mix well. Add powdered sugar and beat until lumps are gone. Pour this mixture over cake in pan. 3. Bake at 350 for 30-45 minutes or until topping is golden. Allow to cool somewhat to set topping (slides off when warm). Recipe from Food.com. 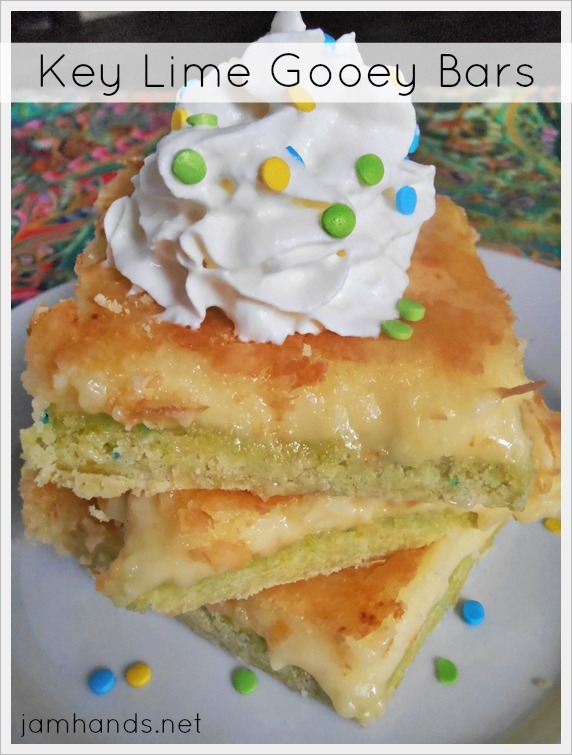 Sharing this recipe at the following fun link parties. I think I can do this. Thanks for the recipe. Wow, Ali...you've got another winner here. Love the photo! Stop by tonight to add it to my Wonderful Wednesday Blog Hop? Add as many as you'd like. Oh wow, these look super yummy! Don't fotget to enter the Giveaway! 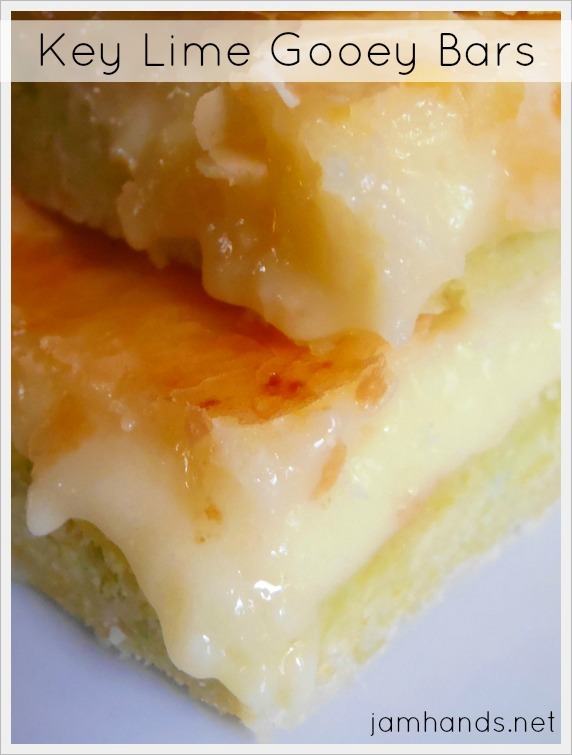 I am liking the key lime gooey bars! Delicious. Oh how simple. I love that. They look wonderful. Thank you for sharing and hosting this party. Making these for a friends house warming party. Could not find Key lime cake so using lemon instead and added fine grated lemon rind in the topping. Can't wait to see how they turn out! Very easy to make! Is the mix you used a key lime cookie mix? I have only been able to find key lime, creams circle, and pink lemonade cookie mixes? Where did you find key lime cake mix?